Attention cupcake lovers of the world. Oh, and attention those who wish to die from stuffing their face with the most ridiculously peanut butter packed chocolate cupcake in the universe. Notice I said the universe. Not just the world. That’s how badass these cupcakes are. If you think about it, it’s really not a bad way to go, is it? Death by peanut butter chocolate food coma. I’m in. I mean, it could always be worse, like death by jelly filled donuts. Ick. Don’t get me started on that. Or, death by chocolate covered raisin poison. Blech. Raisins on their own are the worst, but then to cover them in chocolate is just plain cruel. Why? Because certain people, I’m not going to mention names or anything, could mistake a heavily coated chocolate raisin for a delicious chocolate covered almond, and then, accidentally choke when they realize their mistake. I now eat chocolate coated things with hesitation. Oooh or, possibly even worse, death by frosting overdose. Yeah, so here’s the thing, I’m not entirely a fan of frosting. I eat it, mainly because there never seems to be a way to scoop it off without it getting awkward, but to be completely honest, I could live with out it. I really could. Anyways, lets get back to happy things. Like these cupcakes. This week I wanted to make something that wasn’t so time consuming or detail oriented. I’ve spent the last two weeks making things like Seahawk Sugar Cookies—which required a ton of time and attention to detail—and Toasted Coconut XOXO Shortbread Cookies—which also took up some time because of the X’s and O’s. So, I decided easy, but equally tasty, was the name of the game this week. One thing kept popping up in my mind. Box cake mix. I mean think about it. It’s super easy, relatively tasty, and I’m pretty sure at some point, we have all thrown a box cake mix together. We know box cake mix. We understand that by mixing four things together we can have quality cupcakes in less than 30 minutes. And, that’s a good thing. It’s a very good thing. But, I couldn’t just make a box cake mix and call it a day. That wasn’t going to cut it. Not for the blog. Not for me. And, certainly not for your sweet tooth. 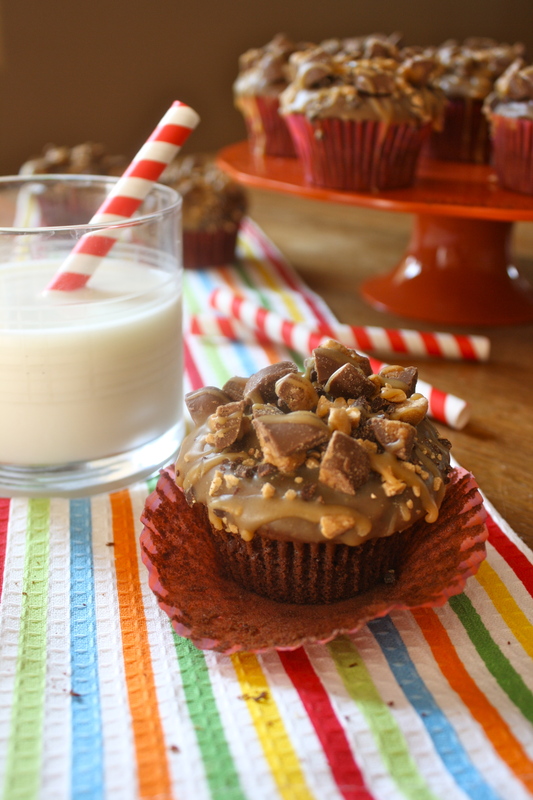 Enter peanut butter chocolate cupcakes that come from, drum roll please, a fancied up box mix. Gasp. How could I? But, really, how could I not? These cupcakes are for the days when you want a top-notch cupcake, but you don’t want to spend a ton of time making them. They are for the lazy days, the days that seem to go on forever, the days that you want something simple, and the days that you need a dessert induced food coma. Let me tell you about these cupcakes. These cupcakes require one bowl and you don’t even need a stand mixer—realistically, you could simply mix it with a spoon if you wanted to. I will warn you, however, that the batter gets really thick, so if you choose the spoon route, prepare to work those muscles. Also, if you aren’t weird about eating batter, please do yourself, and me, the favor of eating some. It tastes amazingggg. I dare you not to lick the bowl, spatula, and spoon clean. 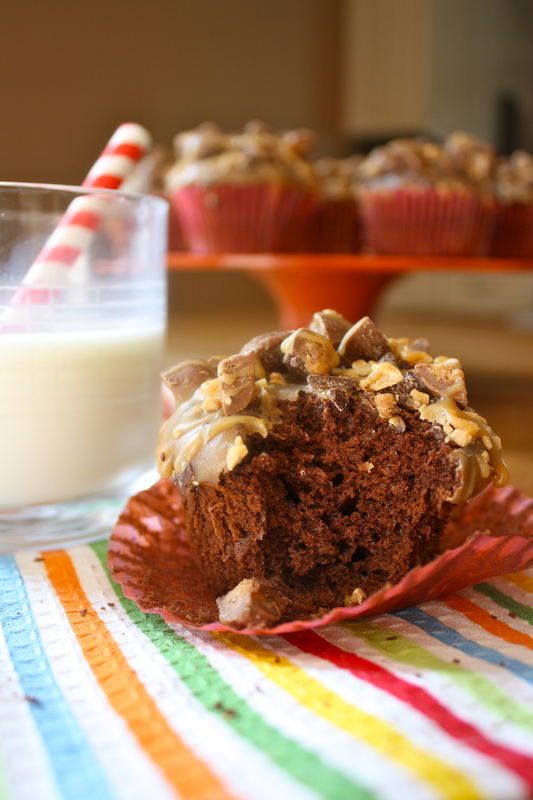 The baked cupcakes come out super moist, almost airy and fluffy, and have that Devil’s food cake taste with a subtly peanut butter undertone. Feel free to eat the cupcakes without the ganache or topping if you don’t want to be in the kitchen anymore. I completely understand. But, if you are willing to wait a few more minutes for complete heaven, make the ganache, which tastes like melted peanut butter, and cut up the peanut butter chips, semi-sweet chocolate chips, and Reese’s Peanut Butter Cups. 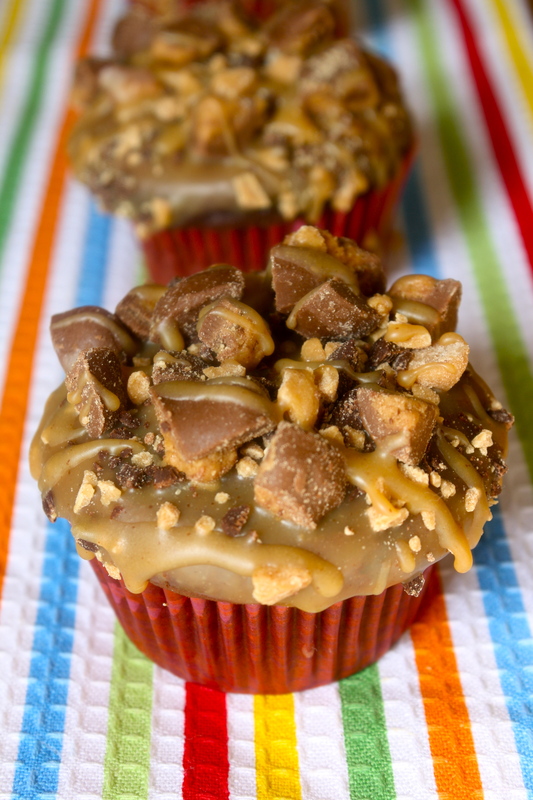 Together, as a whole, the cupcake packs a mean peanut butter flavor that will knock your socks off. Seriously, sit down while you eat these bad boys. But, before you do, pour yourself a large glass of cold milk, grab a napkin, and take two cupcakes. Trust me, one will not be enough. But, then again, when is one serving ever enough? Preheat oven to 350 degrees and line cupcake tin with liners. Set aside. Using a stand or hand held electric mixer beat together cake mix, pudding mix, eggs, milk, butter, and peanut butter until well combined (about 2-3 minutes). Scoop batter into the cupcake liners, about 3 tablespoons for each cupcake. Bake for 18-19 minutes or until a toothpick comes out mostly clean when inserted into the middle of the cupcake. Let cupcakes cool completely on a cooling rack. Once the cupcakes are cooled, begin making the ganache. In a small saucepan combine peanut butter chips and heavy cream over medium heat, stirring frequently until smooth. Once the mixture is smooth and of drizzling consistency, remove from heat and let it cool to room temperature (about 10 minutes). In a medium bowl mix together chopped peanut butter chips, chopped chocolate chips, and cubed Reese’s. Grab a cupcake and dip the top into the peanut butter ganache–make sure to hold it upside down for a bit to allow extra ganache to drip off. Sprinkle the top of the cupcake with the Reese’s and chip mixture. Repeat the above steps until all the cupcakes have ganache and topping. Place in the fridge for 7-8 minutes or until ganache has firmed up. 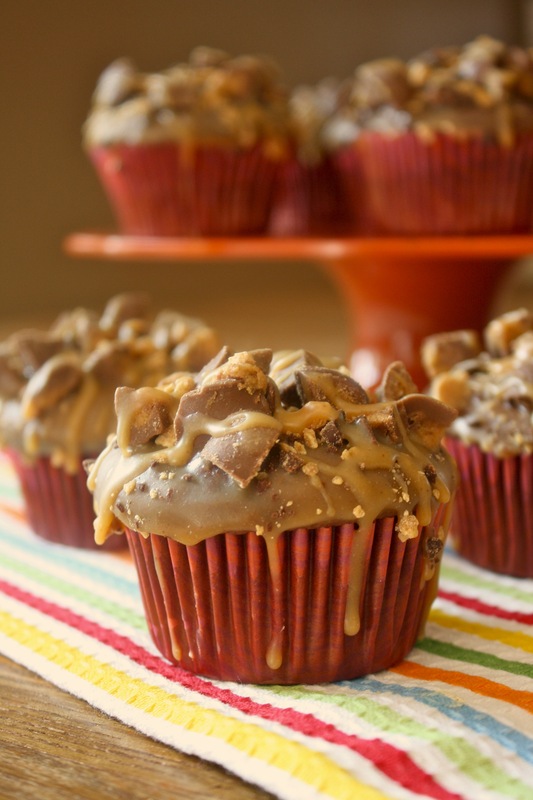 Drizzle each cupcake evenly with the left over peanut butter ganache. Place back in the fridge for 5 or so minutes until the drizzle firms up.